Oversized sash frames create an opulent luxurious look. Soft touch fin weather strip coupled with precision tandem rollers give CAPRI 3.0 a smooth and effortless gliding action not found on other doors. Flush mounted screw covers at exposed screw ports along with jamb pocket covers, in and out, and discrete hidden bumpers give CAPRI 3.0 a smooth finished lock with no visible installation screws. Special multi-finned weather strip at both top and bottom interlock position effectively reduce air infiltration. Superior 2” x ½ “screen with fiberglass mesh, adjustable steel rollers, lock with pull handles and heavy duty zinc keeper. 1” low e argon sealed units backed by a lifetime warranty. The industry’s most comprehensive warranty and customer support policy. Vinyl interior extensions. Wood and foam board cut to size suitable for any wall depth. 10 standard Wood Grains to choose from. 3 distinct upgraded hardware lines. Hi-efficiency glass packages for energy savings and general home comfort. 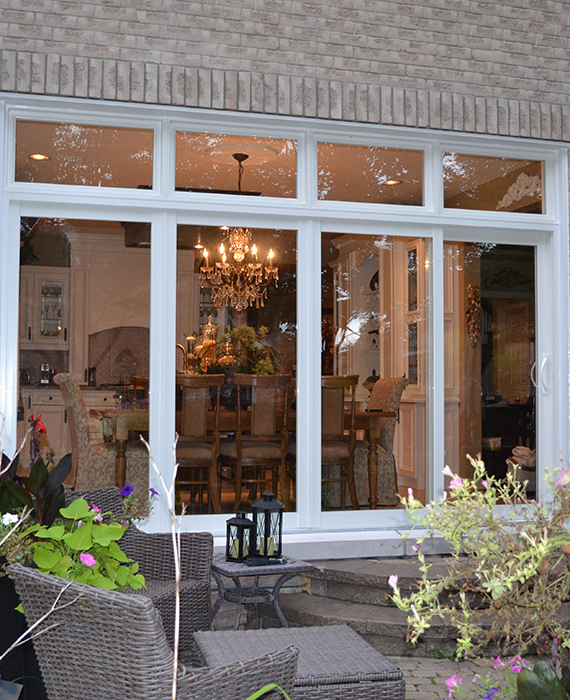 Let Vista’s innovative products change the way you think about sliding patio doors. Copyright © 2019 Vista Patio Doors Inc. All rights reserved.